Bronze, dark green. Second quarter of the 6th century BCE. Height 28 cm. Saint Petersburg, The State Hermitage MuseumInv. No. Б. 578. Helmet of the Corinthian type. 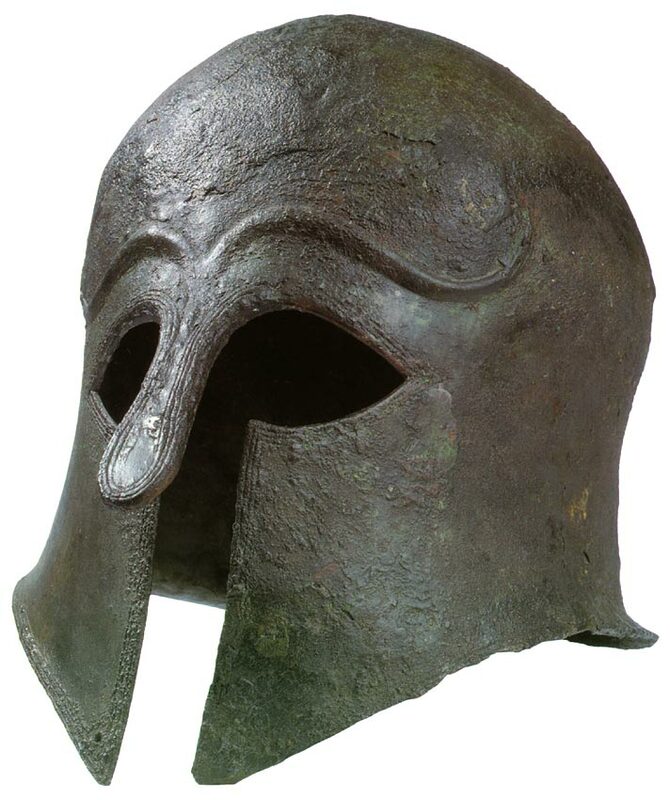 Helmet of the Corinthian type, belonging to a hoplite who was equipped with a shield, greaves, armour and a helmet. The helmet consists of a spherical cap, dented, with openings for the eyes, mouth and chin. At the back, there is a protruding section to protect the neck. The bridge of the nose is protected by a tonguelike guard. The cap ends with cheek-guards which are straight and rigid, not movable as on Attic helmets. The helmet was adorned with a crest. Unpublished, mentioned by Stéphani, no. 376 p. 33. E. Guédéonow (Paris, 1861) no. 3, p. 40. © 1993. Photo, text: Olympism in antiquity. Olympic Museum Lausanne. Bertelsmann UFA. Industria Gráfica S. A. Barcelona, 1993, p. 110 cat. no. 53.